The Orbea Rallon is an awesome ride for high speeds and steep descents. The SB5.5 is one of the best bikes that I've ridden in the past several years balancing downhill stability with a nimble feel suited for trail riding on days when you're not just blasting downhill. Being 5’9” (175cm) in height, I’m at the cusp of being just being tall enough for 29er geometry to work well. My experience is that the increased size of 29er wheels vs that of a 27.5” wheel for medium sized frames results in slacker and slower steering geometry. Though many 29er bikes climb well and have better stability going downhill than 27.5” wheeled bikes, the shortcoming from a perspective of my ride preferences is that many of them require extra effort to steer around even moderately tight corners than an equivalent 27.5” bike resulting in a less intuitive, flowy handling feel. I tend to look for bikes that are well-suited for being one-quiver bikes. 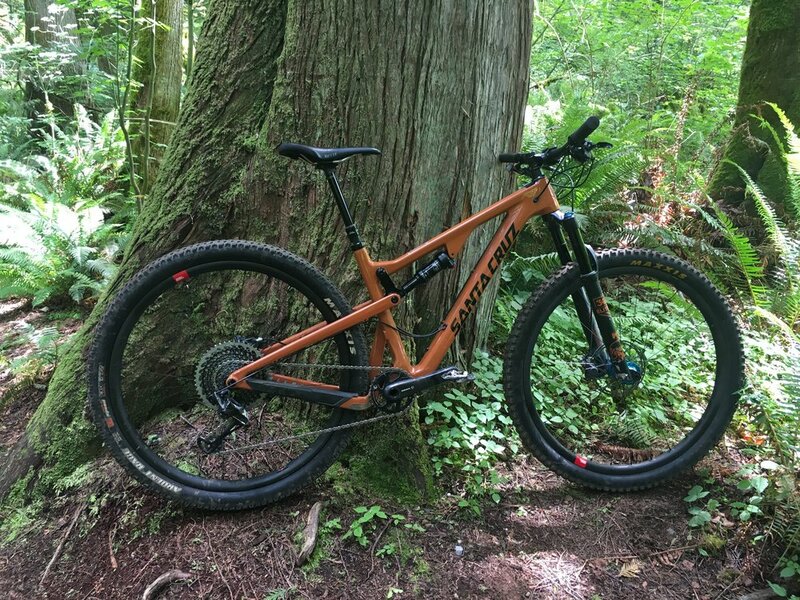 Generally, I feel that these bikes balance good downhill ability with decent level of nimbleness for everyday trail riding along with good climbing efficiency and feel. Some bikes optimize for one or two of these factors and do make sense for either for racers in gravity-oriented events or XC race events. Most non-racers though ride a variety of terrain for which they’ll need to climb to enjoy the descents and are often on trails that aren’t always pointed straight uphill or downhill. Bikes that are good at descending, climbing and nimble handling feel tend to be the one that are most suitable for being that one-quiver, do-it-all bike. The SB5.5 climbs well, if perhaps only missing the final iota of firmness at the pedal and efficiency that some dw-link bikes can provide. With its 29er wheels and Switch Infinity suspension, I had expected the SB5.5 to climb like a mountain goat. While it was a solid climber, the initial acceleration when applying pedal force was perhaps a bit less immediate than I would have expected. That said, once the 29er wheels were rolling, the SB5.5 felt like a locomotive in its ability to maintain speed on less steep climbs and flat terrain. One factor that might have impacted my impressions were that the Maxxis Aggressor rear tire on the SB5.5 demo bike I rode didn’t seem to roll all that well despite apparently being designed as faster rolling than the Maxxis Minion DH-R. If increasing climbing speed is of interest to you for the SB5.5, I might suggest running a Schwalbe Nobby Nic as a rear tire paired with the Maxxis Minion DH-F in front. If better cornering traction is more important, I would suggest running the DH-R that has better cornering traction while still rolling surprisingly well. See our 2016 enduro tire report for more details. 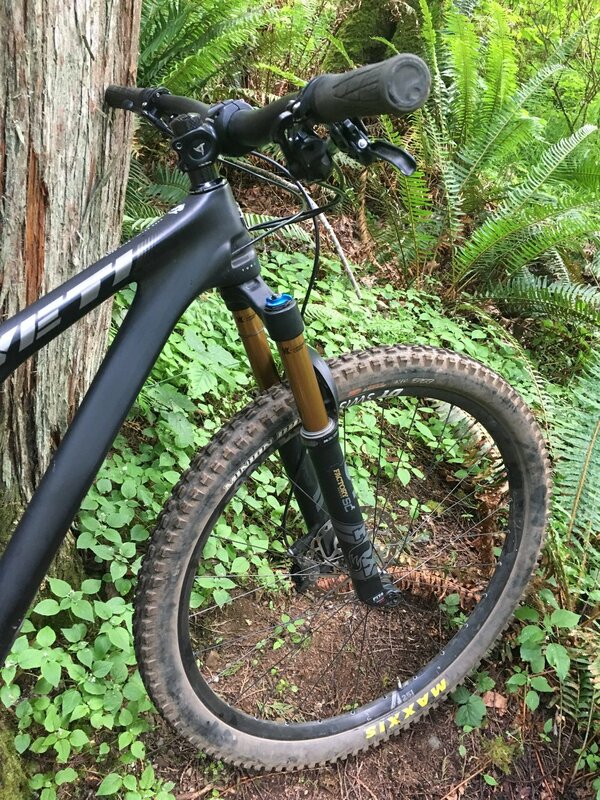 (https://www.dirtmerchantbikes.com/special-events/2016/5/13/pacific-northwest-spring-2016-endurotrail-tire-test-hans-dampfnobby-nic-dh-fdh-r-butcherpurgatory). We’ll probably run a comparison test this year comparing the DH-R, Nobby Nic and Aggressor as rear tires, but based on my initial impressions, it doesn’t seem to make sense to run the Aggressor as a compromise between the DH-R with better cornering traction and the Nobby Nic with better rolling resistance and feel. This is where the SB5.5 really was outstanding from a perspective of fit for everyday trail riding along with confidence when riding steeper terrain. Despite head angle and wheelbase numbers that are actually on the steeper & shorter side, the SB5.5’s 29er wheels provide a welcome degree of stability on steeper terrain. The roll over capability and perhaps the greater gyroscopic effect of the larger 29er wheels provides confidence that the SB5.5 goes where you point it. The steeper head tube angle & shorter wheelbase combined with the stability of the 29er wheels provides a somewhat uncommon combination of stability and nimbleness. Where I was really impressed by the SB5.5 was its cornering ability despite having 29er wheels. Though not quite as quick to turn as some bikes with 27.5” wheels, the SB5.5 handles fast enough to not feel like its slowing you down in tighter singletrack. This is generally the aspect that has turned me off to many 29er bikes especially those from earlier generations of 29er for which handing agility was not a primary design consideration. It was only on super tight switchback turns that are difficult to clean on any bike that the SB5.5 felt somewhat long. The SB5.5’s relatively nimble handling balance is what makes it highly suitable for a one-quiver bike that works well on a wide variety of terrain. I think the SB5.5 is able to balance downhill stability with nimble handling as Yeti has leveraged the roll over capabilities of 29er wheels to balance out slightly faster handling geometry. Here are specs for some long-travel 29ers so you can compare yourself. Comparing the SB5.5 to the SB6 which I’ve also ridden on the same trails, I would pick the SB5.5 as my everyday bike. The SB6 has great stability, but felt sluggish to me on flatter and tighter trails. The SB5.5’s 29er wheels seem to provide almost the same level of stability as the SB6 with geometry that is steeper and faster steering. 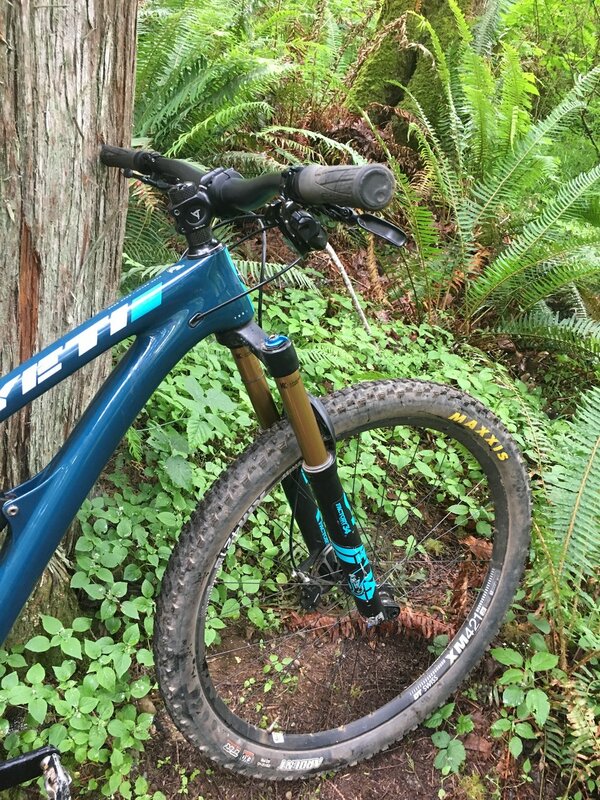 For enduro racing, I don’t have enough back-to-back riding experience on both to make a judgment, but would suggest riding both the SB6 and SB5.5 if you’re interested in getting a Yeti. I really had a LOT of fun riding the SB5.5. It inspired confidence on steeper, looser trails while still feeling decently quick on tighter singletrack. When I test ride bikes at Interbike, I can pretty quickly sort demo bikes out into three categories shortly after getting on dirt. The first category of demo bike are what I call the ‘½ loopers’ which I really want to get off of as quickly as possible by cutting off the test loop as short as I can. The second category are the ‘full loopers’ which I’m happy to ride for a full test loop. Finally the third category of demo bike are the ‘double loopers’ which I’d love to ride for two loops or more. The Alchemy Arktos fell squarely in this third category and I would have gladly gone out for a third loop if common sense didn’t prevail, counseling me to save my legs for ride time on some other demo bikes. A common characteristic of bikes that I seem to like are that they uniformly seem to roll well and are good at maintaining momentum uphill, downhill and on flat trails with an almost e-bike level of glide while coasting. 29ers do this, but some of the best 27.5” bikes now can provide this feel as well. The Arktos indeed rolls really well providing that oh so enjoyable feeling of just flying along the trail. As discussed below in the climbing section of this review, I attribute this feeling to the Arktos’ Sine Suspension’s ability to absorb trail imperfections without hanging up on obstacles. In my experience, few other suspension designs work this fluidly absorbing trail obstacles with little loss of momentum. The Arktos is a great climbing bike, if perhaps only missing the final iota of firmness at the pedal and efficiency that some dw-link bikes can provide. One characteristic that I noticed about the Arktos was its ability to remain fully active on ledgy climbs. Unlike lesser suspension design, rolling up a ledge or rock resulted in no discernable pedal feedback or loss of momentum. In my rating scale, with average climbing bikes such as the current Specialized Stumpjumper rated a ‘3’ and better climbing bikes such as the current Santa Cruz Bronson rated a ‘4’, the Arktos’ exceptional bump absorbing ability while climbing warrants at least a slightly better climbing score than a ‘4’. Descending on the Arktos was completely predictable and intuitive. Very much a point-and-shoot type of bike, the Arktos provides a level of confidence that helps riders to progress to and master tougher descents. Though the trails in Bootleg Canyon tend toward being more open without tight corners, the steering on the Arktos felt quick and intuitive but stable upon first impression. With steering that I perceived to be quicker than that of more DH-oriented enduro bikes such as the Yeti SB-6, Pivot Mach 6, and DeVinci Spartan, the Arktos will likely be a good all-around single bike quiver that is fun to ride on both steep descents and carving fast turns in tight singletrack. No bike does everything well, but the best bikes available today such as the Arktos are able to balance a range of virtues. More specialized designs such as enduro race replica bikes excel at stability and control on steep downhills but require cornering on flat trails to always be done over the handlebars to minimize understeer while faster handling designs can require a higher level of attention and confidence to ride fast downhill. Summary: I had an absolutely fantastic time riding the Arktos both uphill and downhill and that fun to ride feeling is ultimately what a great bike is all about. The DeVinci Django was quite nice to ride with slightly less climbing efficiency as its only real shortcoming compared only to the best climbing bikes. With its Dave Weagle designed Split Link suspension, the Django is quite an eager climbing bike with just a slightly less firm pedal feel than typically better climbing dw-link designs. With a slacker head angle than some other bikes with a similar amount of suspension travel, the Django felt quite solid when descending. It had a similar handling balance to the longer travel DeVinci Troy (140mm travel). Cornering on the Django was quite predictable with perhaps slightly less sharpness in steering response compared to the new Turner Flux v4.0. On the flipside, though the Django may not turn in as quickly as the Flux, it also had a greater sense of stability when cornering than the Flux. The Django was quite fun to ride with perhaps only slightly less climbing efficiency as its only apparent shortcoming. Though the GT Sensor Pro didn’t excel in any single category, it was a solid bike all-around with a noticeably stout feel. The Sensor felt solid while climbing but wasn’t particularly snappy in its climbing feel. My sense from riding the bike is that the Sensor Pro might be heavier than other bikes with a similar amount of rear suspension travel. Descending on the Sensor felt stable, secure and predictable. Perhaps its main shortcoming was its reluctance to adjust its line when cornering downhill due to a suspension design that was less conforming to rough terrain. The Sensor felt particularly stout for a 120-130 mm travel suspension bike but lacked a sense of responsiveness on the trail. This might be a good bike for larger riders and/or those that ride and corner hard. The stoutness of the Sensor’s frame was its defining characteristic though that same stoutness might also be the cause of its less lively ride and handling. The Habit felt great climbing on the road, but perhaps underscoring the need to do demos of mountain bikes offroad, was less efficient when on trails. The Habit’s firm pedaling feel on the road likely comes from the moderately high pivot location for the single pivot suspension system. It works great on paved roads and smooth fire roads, but encountering trail obstacles such as when climbing rock ledges results in pedal feedback. Despite the perceived efficiency of the suspension due to the Habit’s firm feel at the pedals, just a bit more extended time on the bike revealed that the Habit required more rider energy for climbing than more efficient suspension designs with less pedal feedback. Descending on the Habit was actually not bad with frame geometry promoting a desirable handling feel. The Habit’s weak link was the performance of its suspension. Unlike other 120mm travel bikes that effectively utilize all of their suspension travel, the Habit had a tendency not to want to settle well into its suspension travel. The result is a bike that handles decently well, but tends to get knocked around on rocky decents. Cornering on the Habit generally felt decent, but it tended to get thrown off line by trail obstacles. This characteristic led me to be less confident in cornering hard on this bike especially over rougher terrain. Summary: The Habit is a bike with reasonably good frame geometry in search of a better working suspension design. The Mount Vision Pro climbed decently well, but wasn’t a particularly efficient climbing bike. A solid descending feel was probably the best trait of the Mount Vision. Cornering on the Mount Vision didn’t feel particularly sharp, but was solid and predictable. Though this may not read like a particularly positive review of the Mount Vision, it was actually a reasonably nice bike to ride without any negative traits that might become irritating with extended ride time. Before we start, a note to you sharp-eyed Turner Homers about the black color of the Flux that I test rode. Yes, the Flux will be in white only & No, there will not be a black version. This is a pre-production frame that is the only rideable medium Flux currently is existence. So, please...Don't start emailing David Turner saying that you're ready to order a black Flux today. The white color is very nice. Climbing on the Flux feels like hitching a ride on a rocket ship. 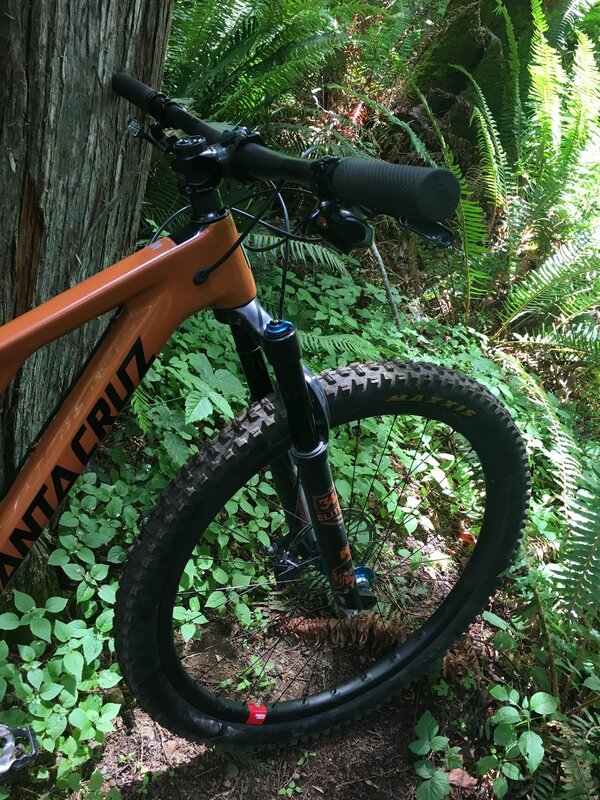 Even compared to the the RFX which two of my comparison test riders have said climbs better than their Santa Cruz 5010s, the new Flux gains altitude noticeably faster. 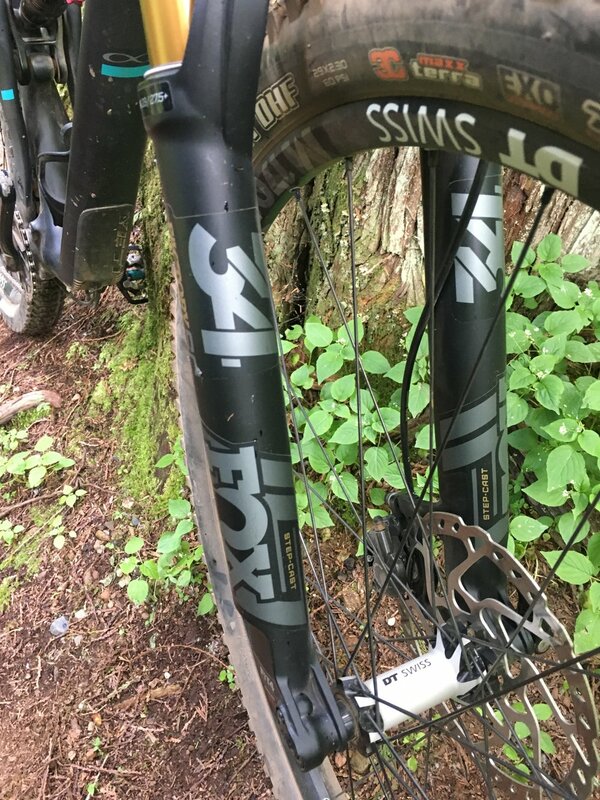 I had given the RFX 5 stars for climbing performance in my Interbike reviews from last year (INTERBIKE 2015: Turner RFX v4.0 Review), but the Flux feels even a good measure more efficient than the RFX. It feels even as fast climbing as many 29ers I’ve ridden. This climbing efficiency does not however come at the expense of traction enhancing bump absorption. The dw-link suspension controls suspension bobbing with minimal compression damping by separating pedal forces from suspension movement. 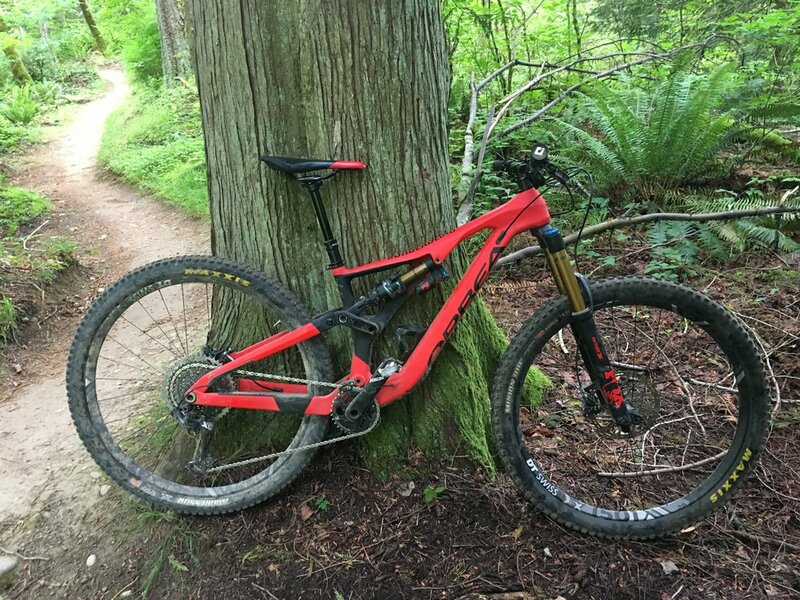 The resulting effect is a bike with a hardtail-like feel at the pedals while still absorbing trail obstacles and bumps to maximize available traction. This may all sound like marketing hyperbole, but all I have to say is that you really need to ride a Turner bike to understand how well it climbs compared to other bikes especially on more technical trails where the suspension needs to remain efficient while contending with roots, rocks and obstacles. The Flux has a sharp handling feel, but does require more attention while descending than slacker angled bikes such as the RFX. The flipside of being more nimble and fast steering is, well, it’s faster steering. Pick your poison...faster steering or more stable. Steering on the Flux is quick and precise. If your trails are more tight and twisty than wide open and fast, this is your bike. Having lived and ridden in the Tri-state area around New York City, I’m quite familiar with how much slower and technical East Coast singletrack can be than West Coast singletrack. The rocks and roots found on East Coast singletrack reward a more trials-like riding style rather than just blasting through trail obstacles. More nimble bikes work great on this type of trail with their ability to thread narrow lines and be repositioned quickly on the trail. The Flux reminds me of my Kona hardtail that I rode back in those days with its eagerness to chase its tail on trails that wrapped around trees only with 120 mm of fully active suspension travel. Here’s how I would compare the Turner Flux to the RFX. Both bikes retain a nimble feel for everyday trail riding unlike some enduro “race” bike designs, but with its faster steering manners, the Flux is perhaps suited to a different riding style and trail characteristics than the RFX. These are some considerations in deciding whether the Flux or the RFX would be the better Turner bike for you. I was pleasantly surprised at just how well the Fuji Auric rode. It has a suspension design based on the Breezer Repack that I rode last year (Interbike 2015: Breezer Repack Review) but that suspension design has been refined and works considerably better on the Fuji Auric than it did on the Breezer Repack last year. Though the Fuji Auric is not category leading in Climbing, Descending or Cornering, its all-around abilities will not hold you back in any way. Though not as fast to accelerate as the category leading dw-link suspension designs, the Auric is a more efficient climber than most bikes using a Horst Link suspension design such as the Specialized Enduro. When I first got on the Fuji Auric riding on gravel roads and pavement, it felt really tall. I actually got off at the trailhead to verify that I was indeed on 27.5” wheels and not 29ers. Once on the trail though, this feeling of being tall and tippy went away. The Auric felt fairly stable and secure in its descending habits though still leaning more towards an XC/trail personality than that of an enduro race bike. Cornering on the Auric is reasonably quick and precise. During my test ride, its steering was predictable and intuitive which is, surprisingly, better than other bikes that I’ve ridden with more exotic pedigrees. Summary: Don’t let my 4 star ratings deter you from getting the Auric. Though not category leading in any characteristic, it is quite good all-around. It’s a bike that I would be completely happy riding without any regret about not spending more or getting a more “prestigious” brand name. With a retail price of $3000 to $4700, the Fuji is definitely worthy of consideration especially when cross-shopped against comparable models from Specialized and Trek.